This story about Fairminded Fran and Selfish Sam is our first in a series of stories which help children explore important concepts like fairness, selfishness, and intellectual empathy. At the end of the story, children are asked to relate the concepts of fairness and selfishness to their own thinking and behavior. This book gives voice, in the language of a child, to fairminded critical thought and selfish critical thought. 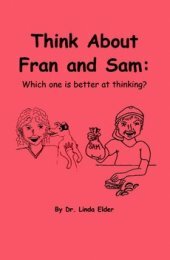 Children read or follow the story to determine which character they would rather be like – Fairminded Fran or Selfish Sam. This book is best used in conjunction with The Children's Guide to Critical Thinking and The Teacher's Manual to the Children's Guide to Critical Thinking.